In October 2011, Varadkar’s predecessor Enda Kenny said: "An integral part of this vision is to transform Ireland into the Digital Capital of Europe." 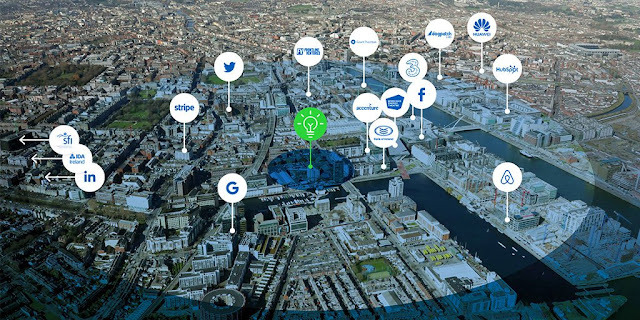 The Grand Canal Innovation District on Dublin’s Docklands will have a new €1bn or more, university campus and the area already has leading tech firms such as Facebook and Twitter — with staff that are mainly engaged in administration. There are no official data on Irish high tech startups and neither are there data as to whether failure rates within a few years are in the range 80 to 90%, as reported from the US. Ireland has one of the lowest general employer firm startup rates in Europe (see below) and for the District to achieve its lofty aspirations, it would have to generate an unprecedented level of startup survivals where there would be no local market for many of the firms. In 2009 as an antidote to the property bust, Trinity College and University College Dublin announced an “Innovation Alliance” that would create tens of thousands of jobs. In the same year, Brian Cowen, the taoiseach, asked attendees at an Irish Diaspora conference in Dublin, to help Ireland to create a European Silicon Valley. In June of that year, Cowen had appointed a 28-strong Innovation Taskforce, mainly comprising of senior civil servants, agency chiefs, professional services partners, university presidents, representatives of multinational and indigenous firms. The taskforce reported in 2010 and wrote “Ireland might aspire to be a leader in Europe and aim to have 15% of employment concentrated in high-tech firms. This would result in almost 346,000 people being employed in high-tech firms by 2020 — a net increase of 215,000 jobs over the period." The report said in respect of Silicon Valley: "It is estimated that 320,000 people are employed in 5,500 high-technology firms." In September 2012, Richard Bruton, minister for jobs, enterprise and innovation, commented in a speech, "As I have said before, our industrial policy must not just be aimed at attracting the next Google or Microsoft to Ireland — we must strive to create the next Google or Microsoft here in Ireland." From 2006 to 2013 and again in 2018, we have delusion and ignorance on a grand scale. Venture capital data are not reliable as big fund-raisings for foreign companies domiciled in Ireland for tax purposes, which may have happened outside Ireland, are typically included. In 2015, Catherine Mann, then chief economist of the Organisation for Economic Cooperation and Development (OECD), a think-tank for 35 mainly rich countries, in a speech in Dublin highlighted the poor links between the FDI sector and the rest of the economy, with Ireland having one of the lowest EU spends on R&D (research and development), despite housing some of the most innovative firms in the world. "Global capital has come into Ireland...but somehow it hasn't translated into Irish-owned firms," said Dr. Mann. "The patents are here, but they're not being linked into the domestic economy, not being levered up by domestic firms or married to domestic workers." Alfred Marshall (1842–1924), a prominent Cambridge University professor of political economy, wrote on industrial districts where business firms in the same industry, including their suppliers, clustered together and where there was both competition and cooperation. Marshall highlighted how localisation was particularly related to physical conditions (such as climate, soil, mines, quarries, access to land or water) such as applied in many English districts like Staffordshire, Bedfordshire and Buckinghamshire. The district was responding to "demand for goods of high quality" and the presence of a town was also inevitable: "almost every industrial district has been focussed in one or more large cities (….). [But] after a time factories, requiring more space than was easily to be had where ground values were high, tended to the outskirts of the city; and new factories grew up increasingly in surrounding rural districts and small towns." From the 1980s Michael Porter, a professor at Harvard Business School, researched clustering, not only in high tech but also in industries such as the wine industry in California. Richard Florida, another American, became an "urban guru" on the publication of his book, 'The Rise of the Creative Class,' in 2002. Florida became the patron saint of gentrification (he has many acolades from his followers listed here) and he inspired many mayors of Americans cities to develop plans to attract well-off whites back to downtown areas. Generous tax incentives and investments in mass transportation were on offer to lure high tech firms and other members of the creative class into once depressed areas — the artists and more importantly the mainly black and brown residents were driven from their homes. “I realized I had been overly optimistic to believe that cities and the creative class could, by themselves, bring forth a better and more inclusive kind of urbanism..the cities with the highest levels of wage inequality happened to be those with the most developed creative economies...As I pored over the data, I could see that only a limited number of cities and metro areas, maybe a couple of dozen, were really making it in the knowledge economy; many more were failing to keep pace or falling further behind. Tens of millions of Americans remain locked in persistent poverty. And virtually all our cities suffer from growing economic divides. As the middle class and its neighborhoods fade, our geography is splintering into small areas of affluence and concentrated advantage, and much larger areas of poverty and concentrated disadvantage. Across the United States, more than one in four suburbanites are poor or nearly poor. In fact, the suburbs of America’s largest metropolitan areas have more poor people living in them than their inner cities do, and poverty is also growing at a much faster rate in the suburbs. Between 2000 and 2013, the number of people living below the poverty line in American cities increased by 29%. During that same period, the ranks of the suburban poor grew by 66%." Innovation Districts essentially are clusters located within cities and in close proximity to a research university. With Cambridge University as the driving force of the British cluster in Cambridgeshire, it has all the attributes of a district expcept the location is not confined to a urban renewal area in a city. Europe and England's oldest high tech Innovation District is in the area in Cambridgeshire around Cambridge University — one of the world's oldest research universities. The district dates from 1960 when a consultancy firm was established to commercialise university research. Cambridge University's income from collaborations and contract work was at £94.1m £33.0m in 2015/16 and income from knowledge and technology transfer was £23.4m in 2016/17. In 2016–17 Stanford received $45.4m in gross royalty revenue from 808 technologies. Stanford University has noted that only 3 out of 10,000 technologies that it has licensed over 30 years have delivered significant revenues. In 2018 an annual data review published by Global University Venturing reported that University of Cambridge spin-outs raised $2.22m in capital for 2013-17, putting it at the top of the global list of universities. 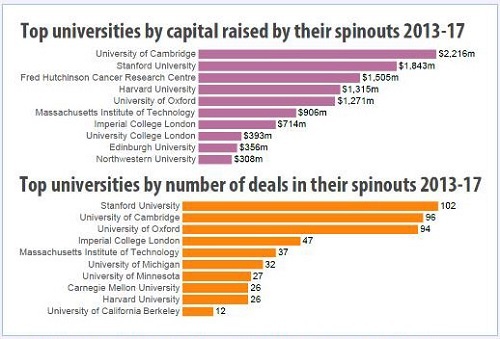 The article also reports that in this period Cambridge’s spin-outs closed 96 deals, making it second only to Stanford University in total number of deals though ahead of it in total capital raised. In 2016/2017 Cambridge University filed 276 patent applications and its commercialisation unit, Cambridge Enterprise, supported 1,714 researchers. In the US only 5% of university patents are licensed and universities had technology transfer income of $3bn in 2015. The top 10% of US universities (by research expenditure) have around one-third of total research spend and IP licensing income. The top 10% of UK universities earn around two-thirds of research and licensing income. According to the OECD, in Europe, only 10% of universities account for 85% of the total income generated by inventions. In the US, 50% of the total licensing income come from only 6% of the institutions (12 institutions in total). UK business expenditure on R&D grew 6% to £22bn in 2016, according to Office for National Statistics and the South East and East of England — which include the university towns of Oxford and Cambridge — accounted for a ratio of 41%. ARM (Advanced RISC Machines) Limited, now owned by Softbank of Japan, was founded in Cambridge in 1990 as a joint venture between Acorn Computer, Apple Computer (now Apple Inc.) and VLSI Technology. ARM has been the most successful tech firm both in the district and in the UK and its chip technology has powered at least 125bn electronic devices. But Daniel said investors are not concerned. “For them, it’s an escalator. You ride it up and you ride it down again. Nationalistically it is a problem but honestly we are a small country and once we develop good businesses, the Chinese, the Japanese and the US companies will buy them,” he said. In the Cambridge Innovation District in the sectors, Information Technology and Telecoms, Life Science and Healthcare, Knowledge Intensive Services, and High-tech Manufacturing, there were 4,745 firms in the year 2016/17, employing about 60,000 people. Over 92% of employees worked in firms that have 19 or less employees while 80% of firms had 1-4 employees. Two companies have more than 2,000 employees; there are 4 including ARM Limited (formerly ARM Holdings) with employees in the range 1000-2000; and 13 with head-count in the range 500-1000. AstraZeneca, Britain's biggest biopharmaceutical firm, expects its new Global R&D Centre, to open in Cambridge in 2020. At least 80% of high tech startups fail and many of those that survive do not grow. What does it take for young entrepreneurs around the world to thrive in a startup hub? 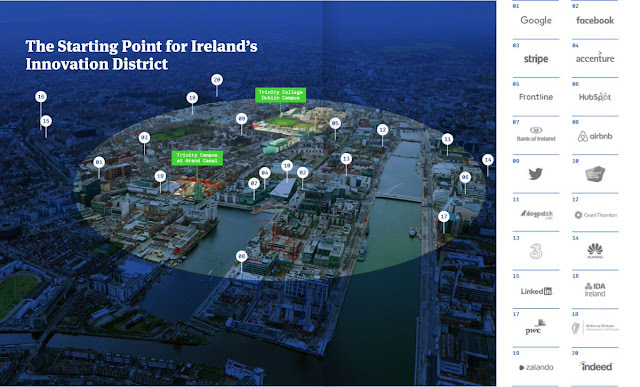 Trinity College Dublin may need a second campus and it already has land since the late 1990s in the Grand Canal area in Dublin known as Silicon Docks, because of the location of the administration staff of mainly American-owned tech companies. Trinity may use its faux-Innovation District to boost its international rankings while getting more public funding and raising the ratio of high-paying foreign students. The Trinity Technology and Enterprise Campus (TTEC) project began with a price tag of €1.25bn and Boston-based Cambridge Innovation Centre (CIC) was engaged to plan facilities for startups. To lure the politicians to provide funding, what better than the dream of an Innovation District that would put Dublin at the top of high tech in Europe and with already about 80 districts worldwide, what's so exciting is the dream of vaulting Dublin to the top 20 in the world to vie with Barcelona and Boston? TCD has financial statements to 2017 on its website but there are no separate data on income from commercialisation of research. The last detailed annual report available is for 2014/15 and in that year there were 18 patent applications and 3 spin-out companies formed. the whole vision of the Grand Canal Innovation District is much, much greater than just the sum of these parts. This is a vision for how Ireland can transform its innovation offering and trigger transformational change to the benefit of our whole country. Ireland must have the foresight to embrace this opportunity. Change is happening, we must accept, control and inform this change so that our economy and society can benefit. We have the opportunity to lead, not to follow. To act, not react. Unlike Science Parks they don't just co-locate activity but they orchestrate, elevate and enable innovation ecosystems to thrive. They introduce a crucial social element through bars, restaurants, residential units and retail; connect innovation activities to local and cultural communities enabling a new interdisciplinary conversation and provide a well-connected place that symbolises the ambition and energy of leading cities. Innovation districts have a consistently higher rate of job and economic growth than other areas of industrial activity. They also have significantly higher levels of knowledge workers and are drivers of patent activity. This could even make Richard Florida blush! This is idyllic for a small portion of the population and while that awkward thing of finding a market for all these discoveries that Trinity research will generate, is ignored. In Israel where there are hundreds of foreign-owned R&D centres, the high tech sector has little impact on the rest of the economy — see here and here. Data from the Cambridge Innovation District above, show that most tech firms either die or remain small. The Danish high-wage knowledge economy is a world leader in food innovation (according to University College Dublin research), commercial shipping, renewable energy, brewing, and Novo Nordisk, the Danish drugs firm, employs 15,000 of its 20,000 payroll in Denmark — the firm that was founded in the 1920s, in 2016 was ranked the 8th in a world ranking of pharmaceutical firm brands. Denmark is also a European leader in biotech patent applications per million inhabitants and it has more than double the Irish rate of total filings of applications for the common global standard patent despite the presence of units of leading global pharmaceutical and high tech firms in Ireland. The Netherlands with a population of 17m is the second biggest agri-foods exporter in the world with 37% of Ireland's utilised agricultural area — they use technology in food production and also sell food technology. Yes, innovation in food would help the whole country while an enclave in Dublin with little innovation being produced, would not. Before there are public funds committed to this fanciful project that laughingly aspires to have Ireland become an innovation powerhouse through workers having lots of meetings in coffee shops, credible facts and realistic estimates should be demanded not aspirations. When a startup with international potential is typically sold to an overseas company before there is a scaleup in Ireland, it's hardly a basis for sustainable innovation in the sector! Jeff Bezos the founder of Amazon.com in 1994 and now the richest business person in the world — Amazon has expanded employment from 30,000 in 2010 to 560,000 today — was interviewed in Berlin in April 2018 by Mathias Döpfner, the CEO of German publishing giant Axel Springer. Bezos talks about the early days of creating Amazon, criticism of working conditions and pay (Amazon announced on October 2, 2018 that it would raise the minimum wage to $15 an hour for its United States employees. The company said it would also lobby Washington to raise the federal minimum wage, which has been set at $7.25 for almost a decade), and what he's learned over the years; how he funds his rocket company, Blue Origin, and what it's like when the president of the United States is your biggest critic.